Today, I’m sharing a tutorial with you on how to make one of my favourite all-purpose ingredients: Ghee. Some of you are nodding happily and some of you are saying “jee? gee? whuh?” The simplest explanation of what it is could be summed up as “Heaven in a jar”. Ghee, pronounced “gee” with a hard ‘g’- is a form of clarified butter made by melting down butter and cooking it long enough to evaporate the water from it, separate, and then toast the milk solids that naturally occur in butter, leaving behind only pure, golden butterfat. The long, slow cooking process results in a concentrated nutty, toasted butter flavour. 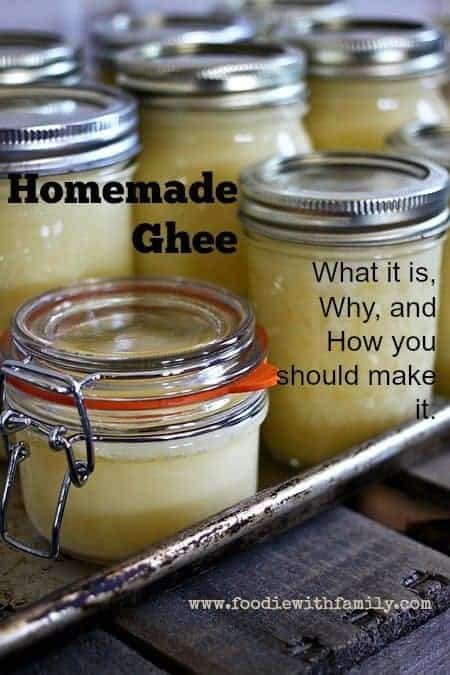 Why Should I Make Ghee? First and foremost, TASTE! Ghee isn’t just for Indian food. It makes the best flavoured fat for frying or scrambling eggs, searing a steak or other cut of meat, sautéeing vegetables or seafood, spreading over freshly baked bread to keep the crust soft, in oatmeal, and just about any other place you’d value a nutty, rich, deep butter flavour. Having ghee available is like having a handy source of browned butter to add to anything you want. In my estimation, 2/3 of the jobs for which I’d use butter can be done with ghee to great effect. The clarifying process raises the smoke point of butter from a paltry 250°F to an impressive 485°F. That’s a higher smoke point than peanut oil, canola oil, or vegetable oil. This is why you CAN sear a steak or other meat in it. Regular butter can’t do this without scorching. It extends the life of butter. Making ghee when you can find large quantities of butter on sale isn’t just a flavour booster. Regular butter is considered ‘good’ for 1 month after the sell-by date when stored in the refrigerator, or 6 to 9 months after the sell-by date in the freezer. (Source) Ghee can be stored, unopened, in a cool, dark, not-necessarily-refrigerated place for 9 months. Once opened, a jar can be kept on your counter top for 3 months. Beyond that, the open jar can be stored in the refrigerator for up to 1 year. (Source) A jar of ghee in the freezer at 0°F can be kept indefinitely. It can make butter friendly for those dealing with casein and lactose intolerance. 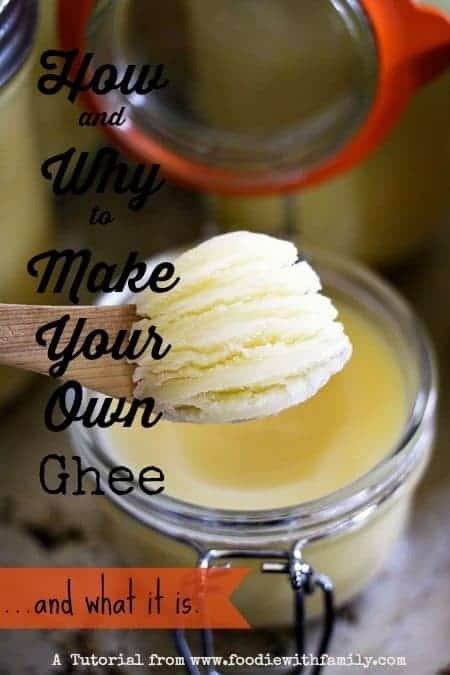 (Source) This does not mean that someone with a true dairy ALLERGY can consume it, but the process of making ghee removes the lactose and casein from the butterfat making it more digestible for someone who experiences unpleasant side effects from eating butter or other dairy. If you are an adherent to a paleo, GAPS, or real food lifestyle, this is not only acceptable, but is highly recommended as a nutritious dietary fat. In short, put a bunch of unsalted butter in a pan on the lowest heat setting you can possibly manage on your stove top then let it go for hours. To expound, occasionally you give it a stir. If (in the words of Liz of The Lemon Bowl’s Aunt Paula) your butter is smiling at you, you’re doing it right. In other words, you’re not BOILING it, you’re really PERCOLATING it. It really is that simple. I’d advise you against leaving the house while it’s done, but other than that, you’re really not tethered to it. When the butterfat has separated out, you skim any foam from the top (Please put that on some toast. You’ll think you’ve died and gone to heaven. ), line a fine-mesh sieve with a flour sack towel or muslin or butter cheesecloth (or a double thickness or muslin or butter cheesecloth for a colander), place it over a heat-safe pitcher or bowl and ladle the ghee into it. This removes any lingering impurities making it keep longer in the jars. One more important word about Liz’s Aunt Paula! Her post is what inspired me to move from my former small-batch mindset on ghee to thinking big. Why a large batch had never occurred to me, I couldn’t say, but it makes sense practically to use her method. If you’re going to be rendering down butter for hours on end, you might as well get as much yield out of the energy -whether it be propane, natural gas, or electric- spent on the process as possible, right? Thank you, Aunt Paula! Why Unsalted Butter for Ghee? There are two main reasons to use unsalted butter to make your ghee. Unsalted butter is generally fresher. Salt concentrates as the ghee is made and can yield an inedibly salty final product. As mentioned, use only fresh, unsalted butter. Because the flavour concentrates as it cooks, you want a good product at the beginning. It is important to use a large, heavy-bottomed stock pot or soup pan for making the ghee. The heavy bottom helps keep the temperature even and helps prevent the milk solids from scorching as they fall to the bottom. You don’t need to stir constantly, but you should stir well occasionally, scraping the bottom of the pan to keep the milk solids from completely adhering to the bottom of the pan. This is because you don’t want it to scorch. They will settle there, but if you keep them from cementing there, your overall ghee will taste better. 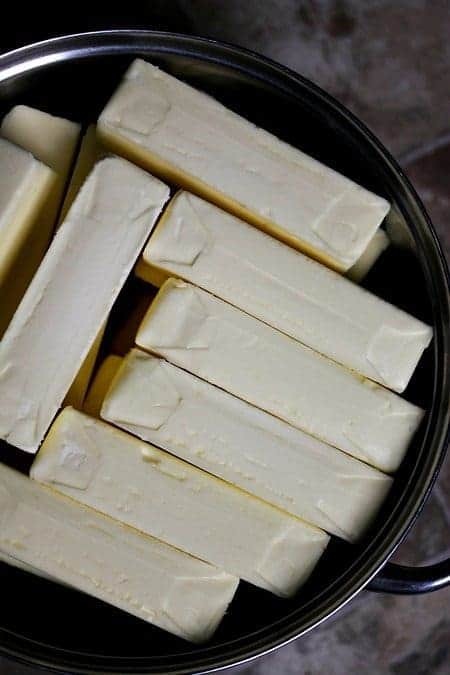 Count on the volume of your butter being reduced by at least 25% overall. For instance, if you begin with 10 pounds of butter (which is the equivalent of 20 cups), you can assume you will end up with 15 cups or so, or possibly less depending on the beginning moisture content of your butter. This is because you’re cooking the water content out of the fat. You’ll know the ghee is done when it is clear, deep golden butter fat, smells nutty, and has a layer of toasted milk solids at the bottom of the pan. You may find your ghee has a layer of foam floating at the top. This is fine. It will all be removed when you strain it. A word on storage: Both Liz’s Aunt Paula and MANY other resources recommend storing the finished, jarred, cooled ghee in a cool, dark room for long term storage. If you choose to do this, I highly recommend that you sterilize your jars (CLICK HERE to learn how to do that.) before decanting the ghee into them. I have a basement that never rises above 56°F in temperature even in the dog days of summer. I’m comfortable with that. If you’re in the south or somewhere particularly humid, you may wish to choose the refrigerator or freezer for long term storage. Be aware that most food preservation authorities recommend the freezer for long term storage, but make your own informed choice. The long, slow cooking process results in a concentrated nutty, toasted butter flavour. Many thanks to Liz of The Lemon Bowl and her Aunt Paula for sharing her method for making ghee and the inspiration to think BIG! Unwrap and add all of the butter to a large, heavy-bottomed stockpot. Place the stockpot over the lowest heat you can manage on your cooktop. If you have a low-powered simmer burner, it is ideal for this job. Melt down the butter and let it cook for 4-6 hours, stirring every so often, until there is a layer of deep, golden, clear, pure butter fat with toasted solids at the bottom of the pan and possibly some foam floating on top. Do not BOIL the butter! The low heat should keep it steadily percolating at an extremely low simmer, but not boiling. Line a fine-mesh sieve with a clean piece of muslin or flour-sack towel. If you don't have a fine-mesh sieve, you can line a colander with a double thickness of muslin or a flour-sack towel. Position this over a heat-proof pitcher or large bowl. Ladle the butter into the lined sieve or colander. When it has all strained, pour it into the jars to within 1/2-inch of the top. Wipe the rims, fix lids in place and let cool completely before labeling and storing. I love ghee and use it quite often 🙂 Love how you explained it for the masses who might not know about this wonder! Thanks, Sherri Jo! It IS wonderful isn’t it? I know. The kitchen is a happy place to be when ghee is being made! HA! Yeah. And there are a lot of folks who know what it is that didn’t know WHY it was awesome or how they could use in dishes other than just Indian ones! I admit I had no idea what this was! It is a great tutorial and I learned something new today! Oh hooray! I’m so glad you got something good from it! Now you have to try it. Trust me… it’s DELICIOUS! I saw this on your Facebook and felt kinda silly because I had no idea as to what it was (other than butter) haha. But now I’m really interested in it! I may just have to make some ghee for myself! I’m intrigued by this! But can you use it for cooking – like in place of browned butter for cookies or is it more of a topping or searing agent? I have never made homemade ghee. I commend you for your patience. Even when I slightly try to clarify butter I get so frustrated. This will be perfect with the Indian flatbreads I just posted. Good grief, girl! You were so convincing, I’m ready to head to the store and buy 10 pounds of butter, price be darned. I love ever reason you gave for using ghee over butter. Many thanks for the tutorial. I wonder if you could do this with a slow cooker?? I just learned so much! What a helpful post! CRUCIAL POINT: how could I have forgotten? It’s AWESOME on popcorn! Thanks for this really informative post! I have never tried ghee before, but now I am really intrigued. So many cool reasons to have it on hand and it sounds so simple to make. Do you have an estimation of how much ghee I would get from a pound of butter? Hey Nancy- you can expect to lose about 25% of the overall volume (I mentioned that in the post.) You would probably have 3/4 of a cup or less when all was said and done. Sorry!! I see now where I missed that. Thank you for letting me know. Um, you are a genius. ps. when can I move in? Anyone who enjoys playing with butter as much as me has to be my soul foodie mate. 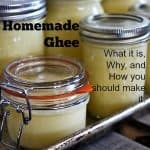 Love this tutorial and I love ghee! No need to spend the extra for it now! It really IS expensive in the stores, isn’ it? I have to try this!! I have always wonder about making gee, so I am so excited! What a fantastic idea to make in a large batch! I’m going to need to do this!! Isn’t Liz’s Aunt Paula genius? At last I’ll be getting around to making my own ghee. Amazeballs… thank you so much for my now weekend project! Just a thought… I wonder if it would work in the crockpot?? A friend of mine made some in the slow cooker and it worked! I’d be sure to prop up the lid so the water can evaporate! Of course, I don’t have times for you, so you’d have to watch it more carefully! I wanted to thank you for this recipe! So many recipes online differ and seem to instruct you to cook the ghee more quickly (essentially boiling it). I used your method yesterday with 3lbs of unsalted butter. It didn’t take me quite as long as your recipe…I think I percolated the butter for about 2 hours before it started browning on the bottom of my pan when I then strained it (I used a coffee filter in my strainer which took some time to drip through). I ended-up filling 4, 8oz quilted jelly jars and a 5th one not quite full, so your estimate of losing 25% is right-on (I started with 48oz and probably ended-up with 36-38oz).I used some of my new ghee last night to brown some turkey breasts and to top some steamed veggies. Delicious! I made this for the first time today. Used a little different process but it looks good. Can’t wait to try some tomorrow. Thank you for the information. I am so gheeful! I made this yesterday as I was preparing for a conference I am presenting at this week. It was a perfect paring- whenever I needed a little stretch break, I stirred the butter turning to ghee. 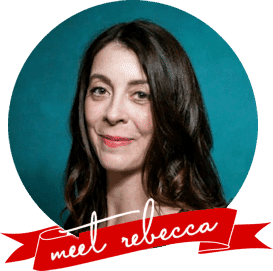 Thank you so so soon much, Rebecca! I especially love that it works without using wheat so that my gluten-free friends can eat our Indian foods with us :). Thank you, thank you, thank you! Didn’t it smell divine while it bubbled and perked, Sunshine? Those little bits at the bottom of the pan spread on good homemade bread or fresh radishes? Shooooo. I need to make more ghee now. I see I’m a little late to the party here, but oh well. Could I make ghee in a crock pot with the lid off, or over a double boiler? My glass topped stove doesn’t heat all that evenly and has scorched things even when I was quite vigilant. Thanks, glad I found your blog–good stuff! I think you could do either of those, Sydney! It’s just a matter of separating the solids out of the fats. Thanks for joining us! I make my Ghee in my crockpot with the lid off and it works great. Hi, I just stopped by to give a small friendly correction. What you describe making is not ghee, it is clarified butter. They’re both delicious, and can pretty much be used interchangeably, but ghee has a different flavor profile because it is flavored with the browned milk solids. This gives it a rich, nutty taste and a dark amber/gold color. * Leave the milk solids and continue to cook the butter on low heat until all of the milk solids have fallen to the bottom of the pot. Now watch carefully! * Keep cooking a little longer until the butter foams up once more. You’re done! Also, I was surprised at your 4-6 hour time estimate, It only takes about 45 minutes in my kitchen. I absolutely love my Ghee and make it often. I make my Ghee in my crockpot only because it’s easier for me. Great post thank you. But I have a question. Would this also work in a small crockpot? I can get the temp lower in my crockpot than my stove. Hi Leslie- That’s a good question. I have not tried that. Please let me know how it turns out for you if you try it! I just made some ghee , and it’s in the fridge how soon did you add the lids to the jars , I boiled my lids , my ghee is in the fridge after it looked like it was getting solid .. also after I open it does it stay on counter or fridge , I also sterilized my jars day before is it best to pour liquid in jar when cooled ?. 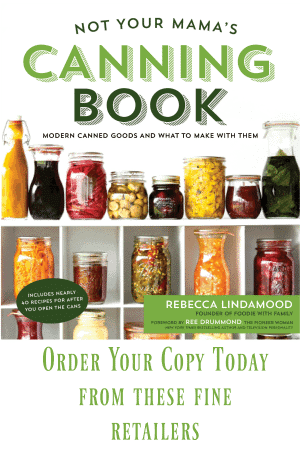 So unsure about the canning process ..
Hi Keith- The company I use for my ads is very good about listening to complaints when ads are reported. There should be an option to report ads that are intrusive right beneath each ad. Please do avail yourself of that. As for why the ads are there, in short, it’s because I spend quite a lot of time and money to run the website which I make available for free (for the low price of scrolling past ads), and the ad revenue not only helps offset it, but is also my paycheck. And the comment box got your comment to me… could you explain what you mean by the comment box not working well? Can you use a crock pot to make ghee? Hi Patricia- I have heard that can be done, but have not personally tried it.